Home > Pests You May Encounter > Can You Spot the Signs of Pests? We’re always being told to be vigilant when it comes to pests and keep an eye out for the early signs of trouble. It is, of course, true that it’s easier to deal with a problem before it becomes entrenched, but you’ve obviously got to know what to look for if this approach is going to work. Do you? If your plants are being munched or your food being gnawed, do you instantly know who’s the likely culprit, or is this the point you phone a friend and ask for advice? Try our quick quiz to see if you can spot the signs of pests – the answers are at the bottom, so have fun and good luck! 1. Which is the most likely FIRST SIGN of mice? 2. Which of these is NOT likely to indicate a rat problem? 3.What does a flea bite look like? 4. Clubroot is a pest of cabbages, stocks and wall flowers; which of these is NOT a sign of it ? 6. What’s the give-away sign of a Cabbage Root Fly infestation? 7. When is your BEST chance to spot a tick on your cat or dog? 8.Which of the following are signs to look out for if you suspect bed-bugs ? 9. The 5mm-long larvae of the carpet beetle are instantly recognisable – but how? 10. 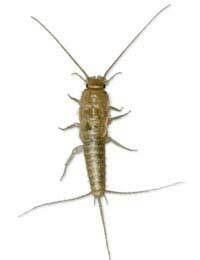 Which of the following is a sign of silverfish activity? 1. (c), you’re most likely to know you have a mouse problem when you find mouse droppings in your cupboards. 2. (b), bark chewed off tends to indicates rabbits or deer, depending how far up the tree it happens. 3. (a), flea bites typically appear as a red spot, surrounded by an area of redness, which can last for a few hours – and is usually very itchy! 4. (c), greyish mould on the underside of a yellowing leaf is not a sign of clubroot – it’s more likely to be downy mildew. 5. (a), those red blisters are a symptom of Peach Leaf Curl – which also, confusingly, affects almonds and cherries. 6. (b), if you’re bothered by cabbage root fly, then the leaves will take on a characteristic bluish tinge and the plant will wilt readily in the sun. 7. (b), you’re most likely to see a tick on your pet once it has begun to feed. Before that it’s quite small and hard to see, and after it’s fed, it’ll drop off and hide until it’s hungry again, but while it’s actually feeding, its bag-like body swells up to the size of a small pea, making it much easier to spot amongst the fur. 8. Actually, they all are – so one point each! 10. (b), yellowish stains and notches on paper and old books can often point to silverfish. 12 – No flies on you! 7 to 11 – Pretty well protected. 2 to 6 – A little chewed. 0 to 2 – Full of holes! @Charlie - only thing I can think of is Springtails which are small insects, about 1 to 2 mm and like to live in places with excessive moisture (kitchens and bathrooms). They could indicate a problem with mold or fungus. I think the best thing to do is check behind your fan and see what is going on. They are harmless and can be removed with chemicals and through drying out the area. When switching on the light/extractor fan over our shower recently tiny mites about the size of a pin head have been falling into the tray from either the fan or loft.What are they and how can I get rid of them?How did they get there?